With four days left until the deadline creditors of Kumho Tire have set for the labor union to agree on injecting foreign capital to save the ailing company, midsized South Korean tiremaker Tire Bank on Tuesday officially announced its willingness to buy Kumho Tire. The abrupt entrance of the Daejeon-based tiremaker into the picture has further complicated the sale of Kumho Tire, with experts casting doubts over the financial capacity of Tire Bank in coming up with 646.3 billion won ($603.9 million), the money required to buy the No. 2 tiremaker. Chinese tire firm Doublestar has signed a deal with Kumho’s creditors to purchase 45 percent of shares of the local company through the 646.3 billion won recapitalization earlier this month. “It was regrettable watching China’s Doublestar (attempt to) buy Kumho Tire. 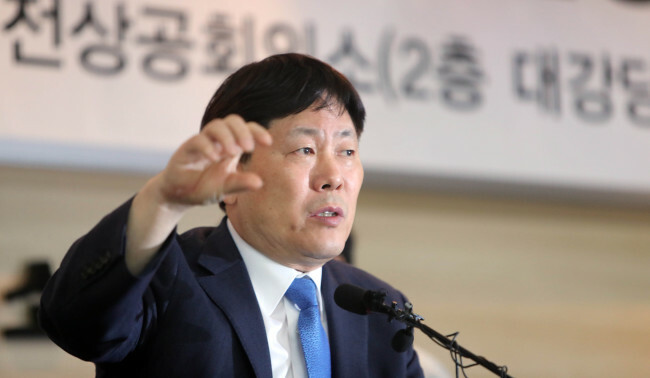 As a local company, Tire Bank couldn’t sit back and watch Kumho Tire’s continued struggles,” said Kim Jeong-gyu, chairman of Tire Bank, in a press conference in Daejeon, South Chungcheong Province. Tire Bank’s 364 billion won asset size, out of which a mere 19.2 billion won is in cash, has left critics doubtful of whether the company is able to purchase Kumho. It employs 70 workers and runs some 400 stores nationwide. In terms of revenue, Tire Bank posted 372.9 billion won in 2016, up 35.28 percent on-year, according to the Financial Supervisory Service. Its operating profit rose 59.93 percent on-year to 66.4 billion won in the cited period. Kim suggested listing Tire Bank on the stock market in order to receive loans by offering the listed company as security. He added it would also be able to save Kumho’s Gwangju plant with 200 billion won, which creditors were planning to transfer as support to Doublestar. Experts are skeptical of such plans as it takes on average a year to prepare for a company to go public and 45 days to undergo screening. Echoing KDB’s stance, Kumho Tire posted on DART -- the FSS’ electronic disclosure board -- that it has not received investment offers from any local company. If the union does not approve of the recapitalization deal with Doublestar by Friday, Kumho Tire will go into a workout process. Touching on the concerns over his company, Kim said it could “take care” of such issues, saying other distinguished global companies have offered a joint acquisition deal. He refused to specify which companies. Meanwhile, Doublestar Chairman Chai Yongsen sent a letter to Kumho Tire employees, reiterating its promise to guarantee Kumho’s independent management, mutual development on cooperation and respect for agreements Kumho Tire has made and will make with the union and workers. Last week, Chai visited Korea to persuade the labor union, which has been doubtful of the Chinese firm’s long-term commitments and three-year employment guarantee. With the emergence of Tire Bank, the labor union ramped up their resistance. “It does not make sense for creditors to apply for court receivership when there are local companies willing to purchase Kumho Tire,” said the labor union.